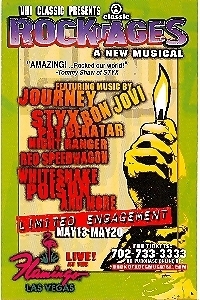 This promo card is for the Rock of Ages Musical, featuring music by: Journey, Bon Jovi, Styx, Pat Benatar, Night Ranger, Reo Speedwagon, White Snake Poison, at the Flamingo Hotel Casino, Las Vegas, Nevada. This limited engagement was from May 13th to May 20th, 2006. Card is 5 1/2 X 8 1/2 inches, in mint condition. Buyer pays 1.95 postage within the USA. International shipping rates apply.